We ale looking for a PostDoc with experiences in Brain-Computer Interfacing! More info here. We host the CYBATHLON BCI Series 2019, more details here. 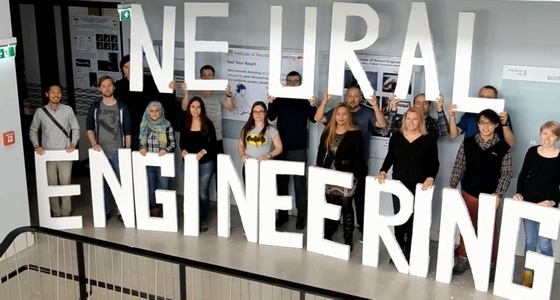 We, the Institute of Neural Engineering at Graz University of Technology, are an internationally renowned research institution with focus on brain-computer communication and dynamics of brain oscillations. We have extensive expertise in electroencephalography (EEG) recording, offline and online signal processing of brain signals and other biosignals, feature extraction, machine learning methods applied to brain patterns, and neurofeedback systems. The so-called Graz BCI was one of the first online EEG-based BCIs introduced over 20 years ago. We have developed various applications for this system, including spelling devices, computer games, functional electrical stimulation (FES), and navigation in virtual environments. We have tested these applications in healthy users and several patient populations. We successfully organized six major international BCI conferences over the last 15 years. Our group is currently involved in the EU project "MoreGrasp" (2015-2018) and Prof. Müller-Putz recently received the ERC Consolidator Grant "Feel your Reach" (2016-2021).